Janet was first interviewed by Anna, an ESA Work Coach at Penzance Jobcentre in January 2015 as an early intervention. She was extremely anxious and at that time had broken ribs following a fall. She was in considerable physical pain. Janet had worked in adult social care until May 2014 when she had what she refers to as a “burnout” brought on by both stress from her job and grieving for her late partner. She didn’t want to leave the house or talk to anyone. In March 2015, having given her ribs time to heal, Janet was called back in for another interview to discuss a way forward for her. The Reach Project run by Rebuild Southwest was suggested to Janet as a way of rebuilding her confidence and self-esteem, something which had been knocked considerably b y her ex-employer. This community-project based course is run by ex-service personal with first-hand experience of both physical and mental health issues. Janet was very unsure but was persuaded by Anna to attend the induction session and then decide whether to do the project. The ESA Work Coach Team at Penzance are always on hand for these inductions to put customers at ease and carry out a warm handover to the Rebuild Southwest Team. Janet attended the induction in April 2015 and despite being very nervous she immediately homed in on another lady in the room who was equally anxious and started talking to her. They formed a bond immediately and this along with the reassuring welcome given by the Rebuild Team encouraged her to stay and sign up for the course. The project was to build a sensory garden at The John Daniel Centre, a local centre for adults with learning disabilities. Janet’s group were the first on this particular project and had the arduous task of clearing a huge bramble patch to prepare the ground for the new garden site. Janet had worked with some of the service users at the centre in previous jobs and they were all very pleased to see her. She has a natural rapport with people and as her anxiety diminished her nurturing side came across and she became “Mother Hen” to the rest of the team. It wasn’t easy for Janet or the other team members to go from being at home, isolated, to being in a group and undertaking physical activities but they were supported by the Rebuild Team. Selena, Sarah and Anna from the ESA Team took it in turns to visit the course every other day to ensure everyone was okay and offer them the opportunity to chat through any concerns. They also attended the end of course presentation to see customers receive their certificates and say a little bit about their experience on the course. Janet found the presentation day overwhelming and was very tearful before-hand. Anna sat and chatted to her about what was upsetting her and persuaded her to stay for the presentation. Janet was unsure what she was going to do once the course ended as it had given her a focus. However the entire group had bonded well and set up a Facebook page to keep in touch with each other. Janet made great progress on the course and in June 2015 she passed her Work Capability Assessment for ESA and was found fit for work. Whilst this was a bit of a shock, Janet embraced the change and made a claim for Jobseekers Allowance, choosing to move forwards rather than appeal the decision. With the help of her JSA Work Coach, Kim, she signed up for an IT course with CMT Services having never used IT and not being keen to do so. . Kim also referred her to the Work Experience Team at the jobcentre who helped Janet register on Universal Jobmatch and get an email address. Janet has volunteered at Bolitho Gardens and in August she staffed a stall for them confidently talking to passers-by about the different plants and seeds on sale. Rebuild Southwest invited Janet back to be a Trainee Mentor for their next two gardening courses. This was set up as a work experience placement, where her confidence grew by the day. Janet has set up a volunteer gardening group for the John Daniel Centre to keep the course participants meeting and moving forward. Whilst mentoring, Janet was asked by the manager to apply for a vacancy within the centre as a support worker. In October Janet asked for help from Anna to set up some online job hunting accounts and teach her how to upload her CV, etc. She also decided to take advantage of the Get Online at Home Scheme and purchase a laptop. 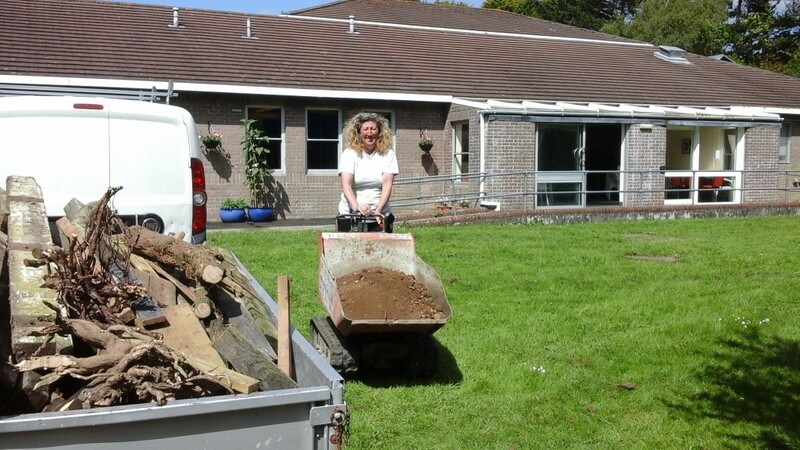 It was whilst completing these tasks that Janet received a phone call offering her the job at the John Daniel Centre. Her DBS check is now complete and she is starting work for 24 hours per week. It has been a long process to overcome her health condition but Janet has been determined to do so. With the support of the Work Coach Team at Penzance JCP, Rebuild Southwest and CMT she has had the help she needed when she needed it.